Bgmart is WordPress ecommerce theme based on WooCommerce plugin. 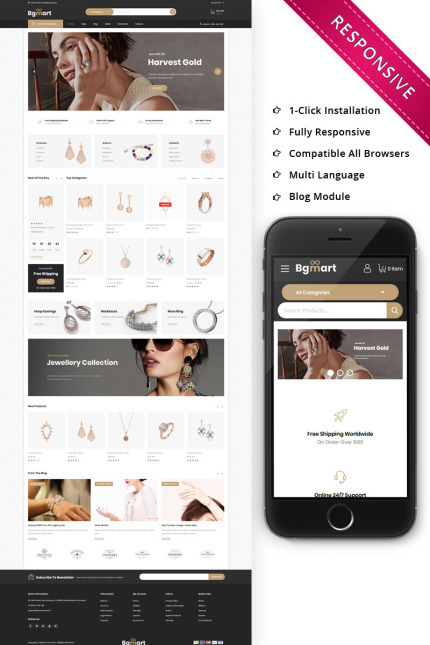 This template is mai for jewellery, fashion design, clothes, lingeries, electronics, mobile, digital, food, vegetables, coffee, plant, auto, cosmetic, fruits, bicycle, kitchen, sunglasses, watches, accessories, furniture and home accessories store. You can use this template for multipurpose store which can be used for any kind of online store. It is looking good with its clean and fresh design. All sub pages are customized.